Air travel is a complex business, and while many airlines try to keep passengers informed of service and schedule changes, being proactive can mean the difference between getting what you paid for and getting stuck with less. Today, TPG Contributor Nick Ewen offers some tips for figuring out what you can expect each time you fly. When you’re booking a flight, you may want to know exactly what to expect on the plane. Will you have lie-flat seats in first class? Does every seat have personal in-flight entertainment? Is your plane WiFi enabled? 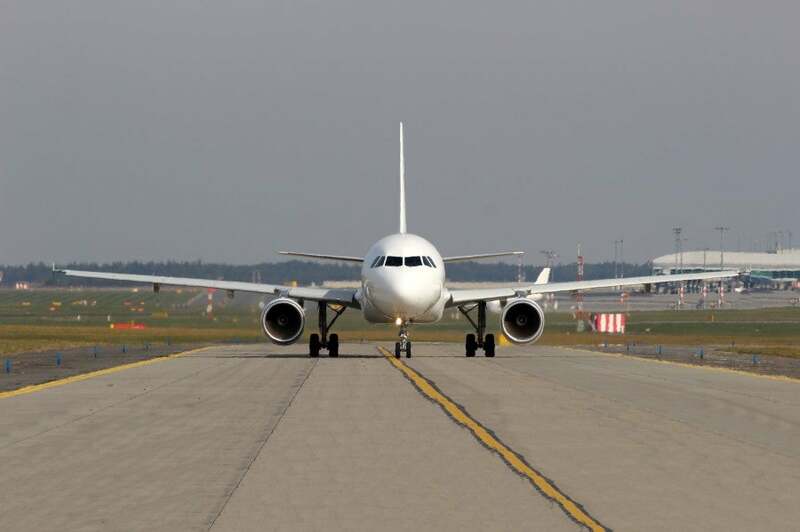 These factors might impact your decision of which flight you take or even which airline you choose, and unfortunately, things can change right up until you actually begin boarding. So today I want to go through some strategies to help you determine what aircraft you’ll be flying, and what amenities you can expect to find onboard. Equipment swaps can wreak havoc on your in-flight experience. Image courtesy of Shutterstock. This wouldn’t be an issue if airlines had consistent fleets and aircraft utilization, but that isn’t the case. It seems like carriers are constantly adjusting their onboard offerings by updating seats, installing WiFi, and changing in-flight services. Even when it looks like your flight has a designated aircraft, last-minute maintenance, weather, or crew issues can result in equipment swaps that may impact your experience. That’s why it’s important to be armed with different tools for checking these things, both at the time of booking and throughout the lead-up to your flight. Delta search results show you what amenities to expect on your flight. Each of the icons is actually a direct link that will give you more information about the in-flight services. Notice that the evening flight has personal TVs and power ports, while the morning flight does not. You won’t get the same degree of information from an online travel agency. All Travelocity tells you is that the plane is a Boeing 757. 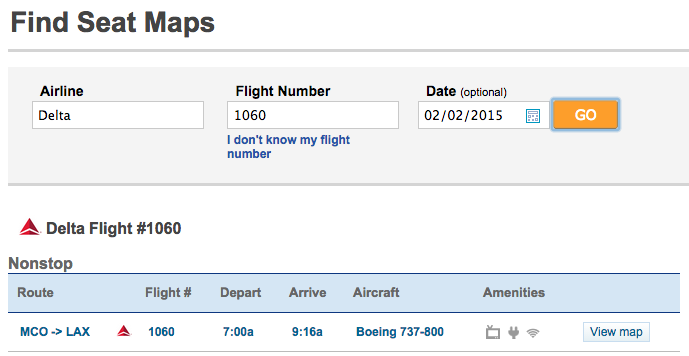 That might seem helpful, until you realize that Delta actually has 10 different 757 configurations in their fleet! Another useful tool is SeatGuru, which provides a one-stop shop for seat maps (and traveler reviews) for just about every domestic and international airline. There are a couple of different ways to use the site. You could browse through the various different aircraft types for each airline, or you can search for your specific flight right from the homepage. I used SeatGuru a few years ago for an award ticket I had booked on American Airlines. My flight from Miami to New York was scheduled to be operated by a Boeing 757, and I was surprised to see that there were only four rows of first class. By using SeatGuru, I was able to quickly determine that the plane was an international 757 with angle-flat seats (as opposed to the standard recliner seats found in first class on most domestic routes). Not bad for a flight under 3 hours! The other nice thing about SeatGuru is that it can guide you toward the best seats on the particular aircraft you’ll be flying. 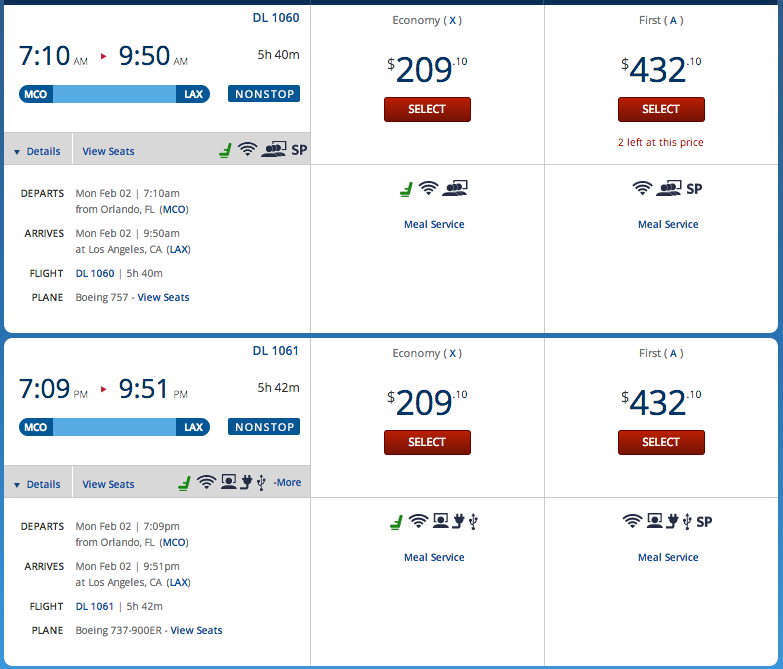 For example, selecting seat 19F on a Delta 757 can be either a great choice or a terrible choice, depending on which 757 configuration you’re on. Seats with positive reviews are highlighted in green, so-so reviews are in yellow, and negative reviews are in red. While SeatGuru is a great option, I offer the caveat that I have found the search results to be occasionally inaccurate. 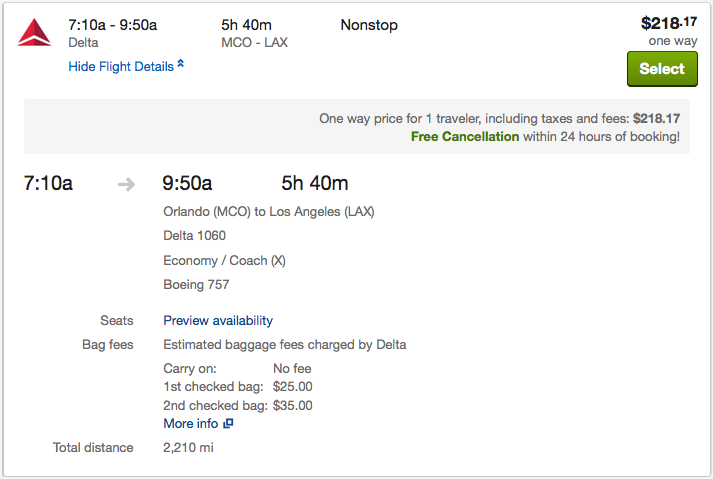 For example, the image above shows a search result for the same Orlando to Los Angeles Delta morning flight mentioned previously. The results from Delta indicate that this flight is actually operated by a Boeing 757, so this particular entry is incorrect. For the most reliable results, it’s best to confirm your aircraft and configuration from multiple sources. Checking your reservations regularly can help you identify schedule and equipment change issues. Seat maps are also important after you book, as schedules and aircraft deployment change frequently in the months, weeks, and days leading up to your flight. Most changes are small, like those from one version of a plane to another. However, there are times when the scheduling and operations team will identify that a particular route or individual flight has too much (or not enough) capacity. In these cases, your flight might change from an A320 to a CRJ900, or go from a 737 to a 757. While seat maps are relatively similar within a particular model of plane, once you start switching aircraft, seat assignments can go crazy. There really isn’t any hard-and-fast rule for this, but I generally recommend checking your itineraries at least once a month in the lead up to your departure. This is especially important if you don’t have elite status and/or are traveling with a spouse, family, or other group. I’ve found that after a schedule change or equipment swap (well in advance of the flight), my seat assignments sometimes change to “Unconfirmed” or “Not Assigned.” This is much easier to remedy if you catch it ahead of time than if you arrive at the airport with your family and all that’s left are middle seats. Most airlines assume no liability for equipment changes or downgraded amenities. So at what point does an equipment change give you grounds to request a free ticket change? Here again there are no absolute rules, as it varies based on the specific situation. Your frequent flyer status may also play into the request as well. Generally speaking, when you purchase a ticket, an airline is obligated to transport you from Point A to Point B, with no guarantees about the type of plane or amenities offered onboard. In other words, if your plane was supposed to have personal TVs, but was swapped for a plane that doesn’t, the carrier is under no obligation to rebook or compensate you. There’s no harm in calling to inquire about a potential change, especially if there has been a significant downgrade. Just keep in mind that the airline is well within its rights to deny your request. When every Boeing 787 was grounded back in 2013, there wasn’t much the airlines could do about it. 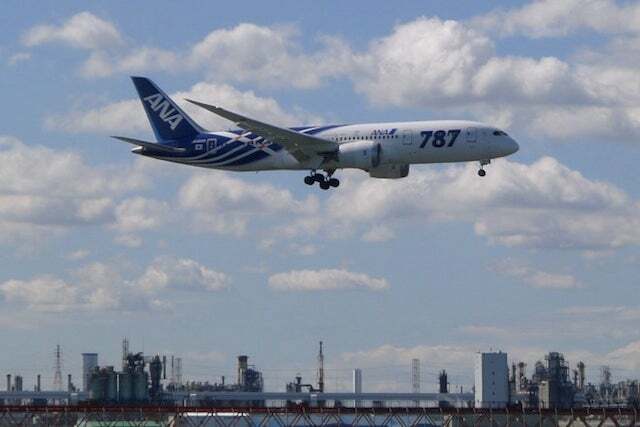 A great example involves the global grounding of the Boeing 787 a couple of years ago. Many customers booked flights specifically hoping to fly the newest plane in the sky (or at least to take advantage of the newest amenities). If you had reservations when the 787 was grounded, you probably had to deal with aircraft changes. There was simply no way that a carrier could fly that plane. That being said, there are cases when a change of aircraft can actually help you out. 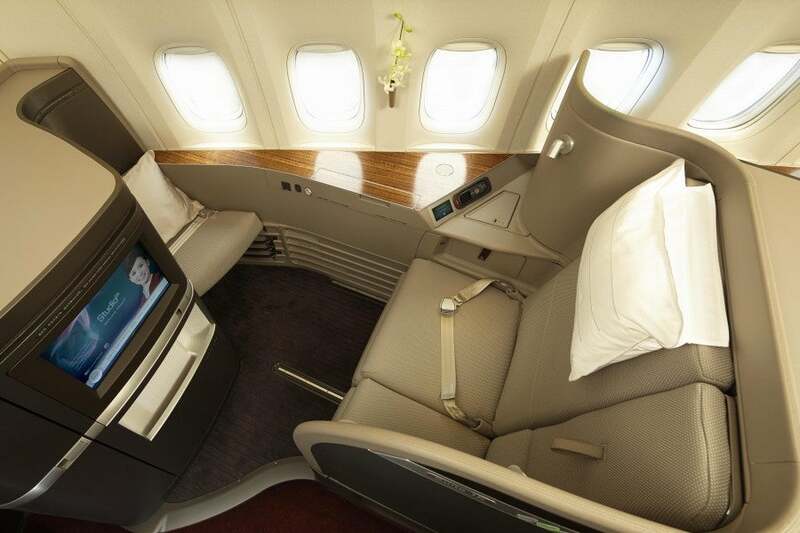 A few years ago, my wife and I used American miles to book round-trip first class tickets to Bali on Cathay Pacific. Our outbound long-haul segment was Toronto to Hong Kong, but a few months before departure, I noticed that our flight had been switched to a 777-300 with no first class. I immediately called the AAdvantage desk, and they worked with their Cathay Pacific liaison to reconfirm us in first class on the JFK-Hong Kong flight. Thanks to a helpful rep at the AAdvantage desk, a Cathay Pacific equipment swap didn’t keep me from enjoying first class. American would have been well within its rights to simply refund us the mileage difference between first and business class on those flights. Again, each situation is treated differently, so there’s no harm in calling to ask if you see that a significant aircraft change has been made. Generally speaking, once you’re within a week of departure, the chances of these swaps are pretty slim, and within 24 hours, you should have a solid indication of which aircraft will be operating your flight. To double-check, log in to your account and find your reservation, or check your airline’s “Flight Status” page. Some airlines also devote a specific page to determining whether a particular service is offered, like Wi-Fi on Southwest. A last-minute equipment swap may make personal TVs but a dream. These are probably the worst of the bunch, as there’s no way to plan ahead to avoid them. A last-minute mechanical issue is the most likely culprit, but sometimes planes are simply swapped due to regular operational decisions. 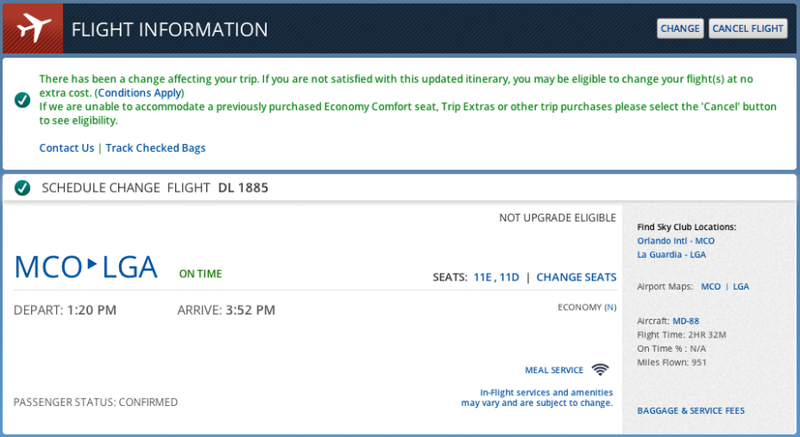 Again, the best defense is a good offense, so if you regularly check your seat assignment and flight status, you should notice these changes as soon as they happen. That way, you can be the first in line at the gate (or the first to call customer service) to make alternate seating or flight arrangements. Unfortunately, there are times when you simply don’t know until you board, at which point you’re out of luck. However, you can always request compensation for an equipment swap after the fact, especially if it results in a class or seat downgrade. I have seen several instances where an equipment swap booted a paying passenger from Economy Comfort/Economy Plus/Main Cabin Extra to regular coach. If you laid out extra miles or paid cash for that seat, the airline is obligated to refund that payment. Other issues aren’t nearly as cut and dry, but it doesn’t hurt to ask for compensation. 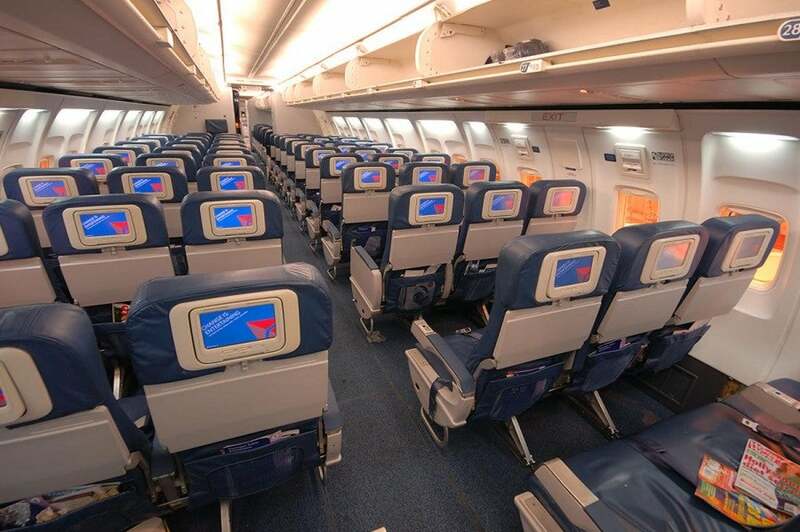 I was once booted from an Economy Comfort seat on a Delta flight from Seattle to Atlanta after a last-minute equipment swap (I was Diamond Medallion at the time). When I brought it up with customer service, I was given 5,000 miles. I’m not advocating that you complain about every little thing, but when an aircraft change significantly alters your in-flight experience for the worse, it’s reasonable to bring your dissatisfaction to the attention of the airline. Aircraft changes can impact your travel experience, but knowing about them is half the battle. It’s a lot easier to make changes months in advance than it is an hour before your scheduled departure time. Even with last-minute changes, there are ways to arm yourself with the information you need, and times where an airline should (or must) provide compensation for an equipment swap. I hope these strategies will help make your 2015 travels as stress-free and painless as possible! What are your strategies for staying on top of aircraft changes?